John Sloan, The Wake of the Ferry II, 1907. Oil on canvas, 26 x 32 in. The Phillips Collection, Washington, D.C. Acquired 1922. After relishing UVa graduate student Tom Winters’ series about his class’s experiments in installing our Main Gallery, I jumped at the chance to attend semester-end presentations at the Center by Tom and his cohorts. 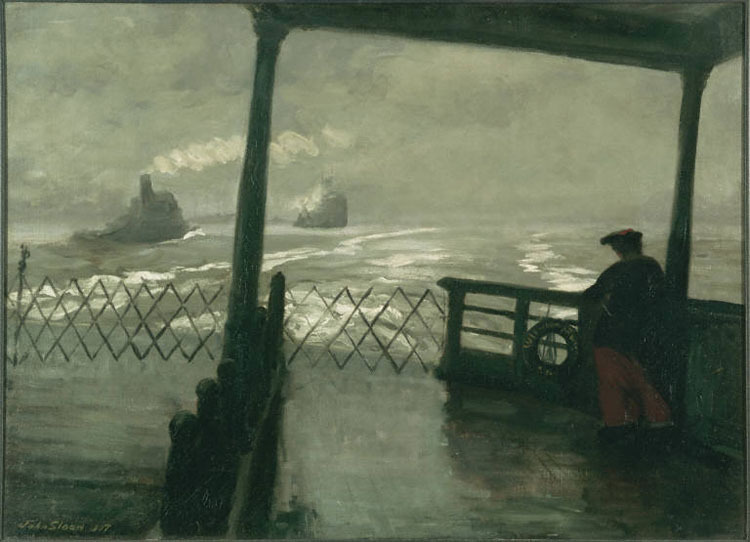 My curiosity was rewarded; Tom’s subject was a painting that I have come to count among my favorites in The Phillips Collection–John Sloan’s The Wake of the Ferry II (1907). Tom discussed the idea of liminality–thresholds, spaces between–in this painting, as well as in Sloan’s work leading up to this work and Duncan Phillips’s collecting interests around that time. In Sloan’s picture, the viewer is aboard the ferry, embarking on a passage between two places. In the grayness and fog, looking back in the direction whence we came, we can’t be quite certain as to exactly where we’re going or when we’ll get there. We know little of our companion, who remains a stranger at a distance with face turned out to sea. Tom traced a theme of liminal spaces–both physical and psychic–with examples including Wake of a Ferrry I (1907) in the collection of the Detroit Institute of Arts. He also offered a compelling argument that a number of Duncan Phillips’s other 1922 purchases evoke a similar atmosphere, heavy with transition and uncertainty, perhaps a comment on our founder’s own state of grieving and recovery following significant personal losses. 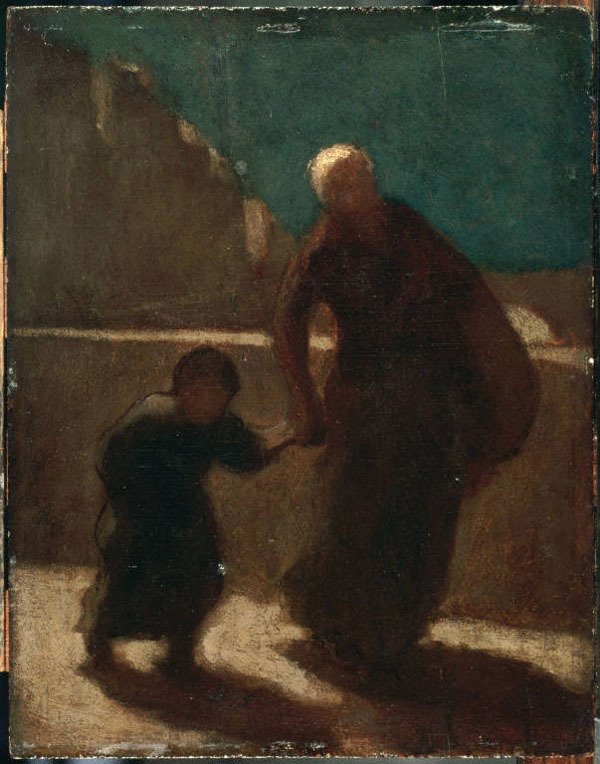 Honoré Daumier, On a Bridge at Night, 1845-1848. Oil on wood panel, 10 3/4 x 8 5/8 in. The Phillips Collection, Washington, D.C. Acquired 1922. Nice post. Wake of the Ferry II is one of my favorite paintings. I wish I attended the presentations. I have never heard of liminal spaces until now. Do you recommend any further reading? Fillin-Yeh, Susan. “Images as Imaginary Documents: John Sloan’s Sidewalks and Thresholds.” In John Sloan’s New York, edited by Heather Campbell Coyle and Joyce K. Schiller, 116-149. Wilmington: Delaware Art Museum, 2007. Tom noted that Fillin-Yeh’s bibliography includes some good sources for scholarly discussions of liminality outside of art historical fields. Cecilia and Matt, you might also be interested in Carol Duncan’s discussion of museums as liminal spaces in her book Civilizing Rituals: Inside Public Art Museums.